For decades, the only way to fix crooked or gapped teeth was with bulky metal braces. For patients, this meant years of poking wires, difficult to clean teeth, and restricted foods. Fortunately, dentistry has now developed a more aesthetically minded alternative that is perfect for patients who want a straighter smile without the hassle of traditional braces: Invisalign. If you’re looking to get straighter teeth in the easiest and most subtle way possible, Invisalign clear braces from Nelson Dental Care are your answer. 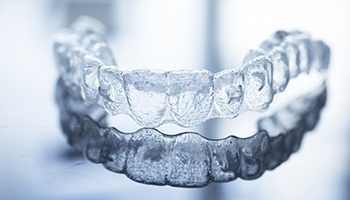 Rather than using brackets or wires, Invisalign utilizes a series of clear plastic aligner trays to straighten the teeth. They simply slip over the teeth similar to a mouthguard, and each one in the series is shaped slightly differently to bring the teeth closer to their ideal position. Once a patient has worn all of their trays, they should have a perfectly straight smile. Subtle Appearance: The aligner trays themselves are practically invisible when they are on the teeth, meaning that most people won’t even realize that you are wearing one. Convenience: The trays can be taken off whenever a person wants to eat or brush their teeth. This makes it much easier to maintain consistent oral hygiene, and it also saves a patient from having to avoid certain foods that would normally damage braces. Speed: In some cases, Invisalign can actually work much faster than traditional orthodontics. Fewer Visits: Invisalign requires fewer progress visits to the dentist than braces because it doesn’t have to be frequently adjusted. Over the course of your entire treatment, this saves a tremendous amount of time. With Invisalign, both adults and adolescent patients can straighten their teeth without having to compromise their daily appearance. It simply offers the best when it comes to speed, effectiveness, and comfort all at once. To see if Invisalign is right for your smile, simply contact our office today for a consultation.